Mom’s are brilliant. I believe this is a well known fact but since Mom’s Day is this weekend let me give you a couple examples of random everyday knowledge my Mom has passed on to me proving she is brilliant. I think I might go for a hike – COUNT ME IN. YES. How about an all night movie marathon? – HOW ABOUT I BRING THE POPCORN. YES. See it’s easy and if fun isn’t found you will have a good story. There is a partner saying that says, “You make your own fun.” and using that piece of logic anywhere you are has endless potential for being entertaining. * “A women who works full time deserves the services of a cleaning lady.” – AMEN. I’ve lived by this for awhile now and I’m amazed how happy I am after the cleaning lady has been to my house. I literally dance around happily over the vacuumed floor while breathing in the freshness of AJAX fumes. My only regret is having her come every other week instead of weekly. My dream is to have someone come in every other day. CAN YOU IMAGINE. I NEED TO BE RICH SO I CAN HAVE THIS. I’D BE CONSTANTLY HAPPY!!! CONSTANTLY!!! One of my friends once said that she would give up food before she would give up her cleaning lady. Preaching to the choir my friend! I mean take a look at the picture above. THAT is what I came home to recently. 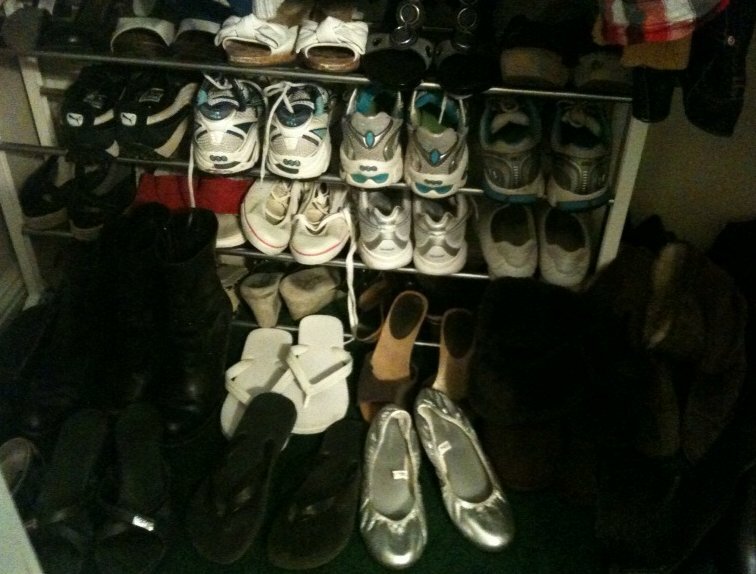 I didn’t even know I had 3 pairs of old running shoes still saved in that closet until that moment. WHAT A BRILLIANT VISUAL OF ORDER AND CLEANLINESS. Thank you Wendy. You are a wonderful daughter and I've picked up great nuggets of information from you as well!